We have passed the one-month mark since deployment of our first tag and what a month it has been! Meanwhile, Nan and the team SOMEHOW have recovered tag #87625 - the one that got deflected by a wave just as it was about to deploy! Last I heard, it was sitting on 46 meters down just outside Avana Harbour, when all of a sudden - PING! - a location shows up on my Argos satellite map. Unreal. I've been doing all I can to educate and raise awareness regarding Oceania's endangered humpback whales (when not checking Argos or teaching here at U.Canterbury). The kind folks at the U.S. Embassy in Wellington, New Zealand even invited me to give them an interview on our research. Thanks much Jamiela, Michael, Laura, Ola, Tracey, Rob, Candy and all the good people at the embassy! You can link to the interview below (it's 20 minutes long - what can I say...I'm excited!). It's been an exciting 7 days since my last Megaptera14 humpback whale migration update! One transmitter tag has come back to life, one whale has been content cruisin' around Raro, and 4 others have made haste to new island homes. The data never cease to amaze me! Tag #87777.14 just started transmitting locations again after a two-week hiatus. Last we heard from 87777.14, "he" was headed north away from Rarotonga. Approximately 21 hours ago, 87777.14 started sending transmissions again and it's looking like he misses Nan and the team - he's heading back towards Raro from ~700km due west of the island! 23 Sept, 2014 update of humpback whale movements. Since transmissions stopped on Sept. 8, 2014, it's anyone's guess what 87777.14 got up to. I have sketched in an ~1735 km long circuit route on the above map in yellow dashes. At an average traveling velocity of 5 km/hr over the 347 hour-long gap in transmissions, 87777.14 would have swam 1735 kilometers - the same distance as the yellow-dash circuit route. However, if I had to bet on where 87777.14 actually went, my money would be on Manu'a (American Samoa). It's highly unlikely that it swam any faster than 6 km/hr for any extended period of time (this based on both the 2007 and 2014 swimming speeds observed for other humpbacks in the region). That would make 87777.14's maximum total distance traveled ~2100 km for the period between Sept. 8 and Sept. 23, 2014. It could have made it all the way to Upolu, but it wouldn't have had any time hang-out once it arrived there. The only other islands it could have reached, and had time to cruise, are Palmerston and Niue. Where do you think 87777.14 went? Most of the other whales seem content hanging/cruising around new island homes. 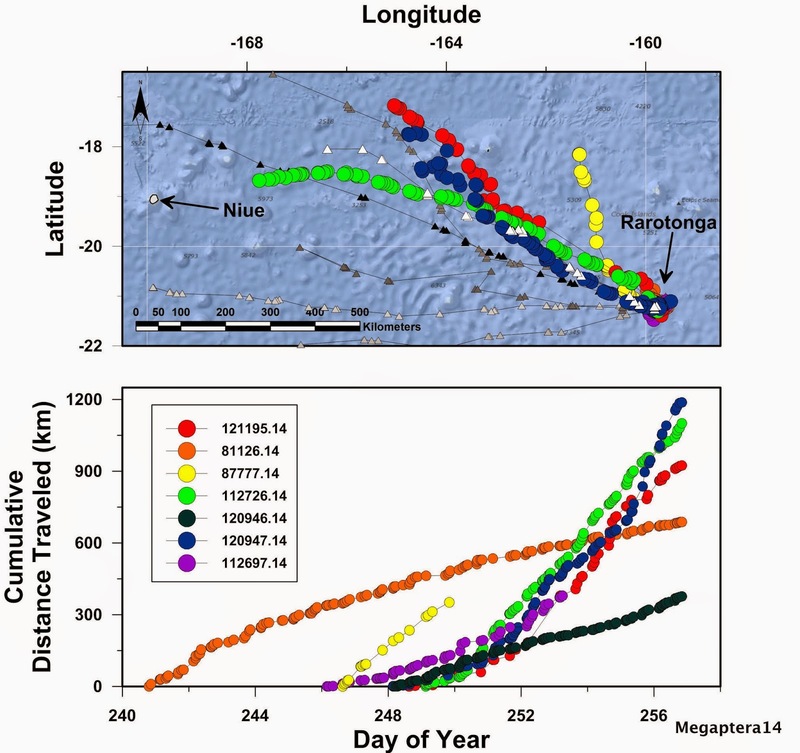 112726.14 has spent time around both Niue and Vava'u (but it's now heading south-southwest parallel to the Tonga Trench!). 121195.14 has been around Manu'a for a few days now, and 81126.14 has stayed true to the Cooks and has been cruising around Atiu way for several days. 112697.14 is our home-body - it's still around Raro, and 120947.14 is my favorite because it followed the same ~550 km long 'straight as' track as 2007 tag #37282.07 (highlighted by the red ellipse in the above map). ...I've prepared some YouTube clips. These are not just regular old home movies, folks. These are truly spectacular images that capture some magical moments. Enjoy! I'll post an update on the whale movements in a few days. Thanks for following along! Now that I am back in Christchurch, my updates to Megaptera14 are going to be about once a week. Monday nights (NZ time) work best. But I do promise to keep updating you all so long as these tags are transmitting! For this week's update, I've prepared some graphics. Top of the order is an update on where our whales have headed (this will be the standard lead-off position in the weeks ahead as well - Figure 1 is almost always a map when you're dealing with a ball-playing geoscientist!). There are several interesting points to make about the whale movement data presented in Figure 1 (below). First, the migrating whales are moving west/northwest along very similar paths. This 'route fidelity' is fascinating to me as none of these whales are ever in the same place at the same time. They might very well pass over the same chunk of ocean floor (~5000m below them! ), but they're doing so at different times (n.b. - the tracks symbolized by triangles are from 2007! The larger colored circles are the 2014 data.). If there is an outbound migration corridor around Rarotonga, it is most certainly to the west-northwest. This gives us strong evidence to suggest potential 'no-long-line-fishing' zones during certain months of the year - a triangle connecting Rarotonga, Niue, and Palmerston would be a great start! Second, our 2014 data is much higher temporal resolution than our 2007 data. In other words, we are receiving more transmissions per day from each tag in 2014 than we did from each tag in 2007. This is GREAT PROGRESS as the temporal resolution of the data dramatically impacts the level to which we can interpret each whale's movement behaviors! More data points means we have a greater chance of capturing turns, slow-downs, speed-ups, etc. I am very excited by the temporal quality of our data this year. Here's hoping the tags keep transmitting for several months!! Third, I might be seeing things, but it sure looks like 112726.14 got a call from Niue yesterday and decided to stop in for a visit. 'She' should arrive in Niue late on Sept. 15 local time if she keeps following the same trajectory. Now you might think I'm really starting to see things if you believe me when I say that it looks like one of the 2007 whales did a very similar thing just before its tag dropped (medium grey triangles approaching Niue from the east-southeast). Maybe polynesians really did 'ride whales' when they were island hopping during the past millennium? Fourth, the Distance Traveled versus Day of Year plot shows that this year's migrators are a fast bunch. They've been swimming ~6-7 km/hr for the past week straight without stopping - day or night. Cool. 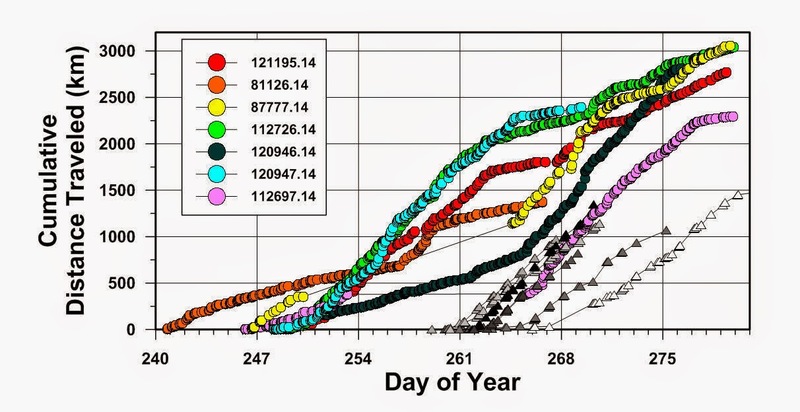 Figure 3 shows all of the whale locations the Argos system has received as a function of hour of the day. The vertical axis is plotting the 'error radius' of the whale location as determined by the Argos system (all those 'B' quality locations have largely 1-5 km errors - which is not so bad considering the spatial scale of the migrations). The parabolic curves are plotting when each of the Argos system satellites are able to receive radio transmissions (i.e. the vertical axis for the parabolic curves is basically how high in the sky the satellite is during its passage over the region). I can't see any clear pattern relating satellite position, or satellite count, to error radius. And it looks like our chosen transmission periods don't have many holes/gaps; we deliberately pre-programmed the transmitters to save battery and shut-down when the 'NP' satellite was passing as it was the sole satellite during its passages over Oceania this time of the year. 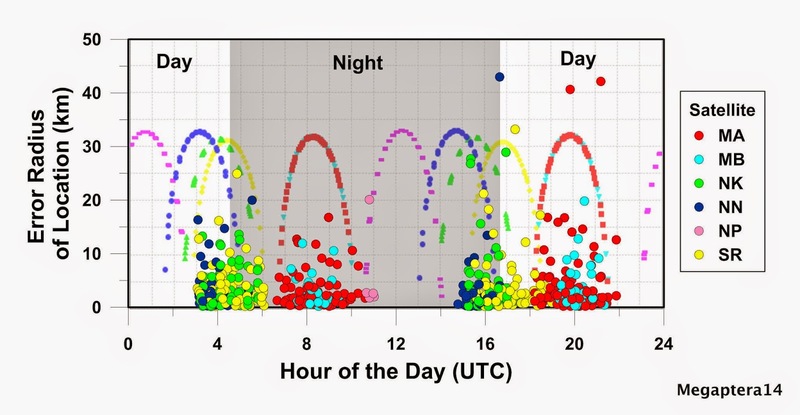 Figure 3 - Relationship between satellite transmission data quality (as Argos error radius), time of day, and receiving satellite position. Perhaps the BEST thing about Figure 3 is that it shows quite clearly that we're capturing both sides of dawn and dusk nicely. Crepuscular (homework = look it up!) behaviors are common in the biosphere and I quite deliberately made sure that we set up the tags to collect data across these important times of the day. I'd estimate that half our data was collected during periods of darkness and half our data was collected during periods of daylight. The possibilities indeed are endless. And I'm curious as to whether or not last week's class 2 solar flare wrought any havoc on the navigational systems used by these whales. Another topic for another day, perhaps?